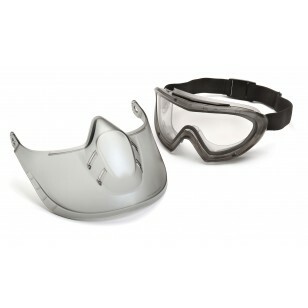 Pyramex Safety - Capstone - Clear Anti Fog Dual Lens with Clear Shield - Capstone goggle incorporated with removable shield provides full face protection. The shield with ratchet allows user to open or close in 3 positions for adjustment; 4 ventilation holes provide appropriate airflow. The polycaronate shield conforms to the face offering increased impact and dust protection. Indirect-vent frame provides protection against splash and dust. Soft vinyl goggle body conforms to facial contours for a very comfortable fit. High Impact resistance against flying particles. Fits over prescription glasses. Fully adjustable elastic band. Includes 2 disposable tear off visors, which can be replaced as they become dirty or scratched. © 1997-2019 Enviro Safety Products. All Rights Reserved.